John Chambers kills speculation that he may be out soon, saying he's been asked to opt in for three more years. 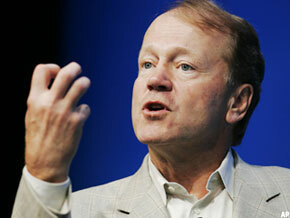 NEW YORK, ( TheStreet) -- Cisco ( CSCO - Get Report) chief John Chambers says he's willing to stay another three years. Answering questions at the end of an analyst day presentation, Chambers was asked if he and the board were in agreement on the direction the company is headed. Chambers said the board met three days ago and the "answer was a resounding yes." The board, according to Chambers, also asked if he would be willing to commit to another three years as CEO. "And I said I would," Chambers disclosed. There has been no recent announcement about any contract extension, but clearly Chambers wanted to put to rest the speculation that he is in the hot seat and a replacement may be in the works. Investors and analysts heard presentations from several key Cisco executives Tuesday, a group considered the bench where a CEO successor would be chosen. Cisco, led by John Chambers, could offer upside, say analysts. The comment came at the end of the trading session. Cisco shares finished up 1.6% at $16.35 and were slightly lower in after-hours action.